Fix the Virago 250 gearing ! Changing sprockets (gearing) on Yamaha Virago 250 to 17/38, 17/40, 17/42, etc. The stock sprockets on the Virago 250 are 16 teeth (Front) and 45 teeth (Rear). Yamaha sells this model worldwide; the gearing is probably fine for some areas, but for travel on “high” speed paved roads, in my opinion the stock sprocket choice is way too low. For any Virago 250 that is running strong, I would go with 17/38, 17/40, or 17/42 depending on your driving conditions. If you have changed your rear tire size, that could affect your decision also. Examples: If you seldom carry a passenger and don’t have many hills in your area, 17/38 could be good choice. If your bike has extra weight due to added windshield, saddlebags, etc. and heavy rider, you might go 17/40, or 17/42 if your area is hilly. If you have a hilly commute but intend to go to smaller rear tire (120/90-15), 17/38 could be good choice, since the smaller rear tire will give you the equivalent of 17/39. I changed my Virago 250 to 17/40. It’s a different, better, more useful bike now – more like a real motorcycle should be. Instead of going through the first four gears by 30 mph, I get to actually use the transmission like on most bikes. The motor is less revved up. Taking off from a stop is absolutely no problem (I am 210 lbs or 95.5 kg). The stock 16/45 takes off super easy but this is because it is the wrong gearing – taking off with 17/40 is no harder than with the average motorcycle. Yamaha was not doing beginners any favors with the “granny” first gear – people should learn how to take off on a motorcycle with normal gearing. You could think of the change to 17/38 as a transmission change – it is like you discarded 1st gear (which is too low anyway) and added a 6th gear. It is not really accurate to say 17/38 will result in lower power or torque, because you would probably be in lower gear. 5th gear with the stock 16/45 is about like 4th gear with 17/38. -Les S.
1) Your Virago 250 is not running as strong as when it was new. 2) Half of your riding is in hills, and half is fairly flat highways. 3) Your bike has a windshield, saddlebags, and possibly other heavy accessories. 4) You do not carry passengers often. 6) You have the stock size rear tire (130/90-15). Based on this, I would go with 17/40. 1) Half of your riding is in hills, and half is fairly flat highways. 2) Your bike has a windshield, saddlebags, and possibly other heavy accessories. 4) Your Virago 250 is running very strong – as strong as when it was new. 5) You do not carry passengers often. Based on this, I would go with 17/38. 4) You have a larger size rear tire (140/90-15). 5) Your Virago 250 is running very strong – as strong as when it was new. 6) You do not carry passengers often. 1) Most of your riding is in hills; the rest is flat roads. 2) You carry passengers fairly often. 3) You have a larger size rear tire (140/90-15). 5) Your bike does not have windshield, saddlebags, and possibly other heavy accessories. 3) You carry passengers fairly often. Based on this, I would go with 17/42. The chart below shows the number of links needed for each sprocket combination. See link above – the chart below used the data from this link. This entry was posted in Motorcycles and tagged 17/38, 250cc, V-Star, Virago, Virago 250, Virago 250 modifications, Virago 250 mods, Virago 250 sprocket mods, Virago 250 sprockets, XV250, xv250 gearing, Yamaha. Bookmark the permalink. 66 Responses to Fix the Virago 250 gearing ! Changing sprockets (gearing) on Yamaha Virago 250 to 17/38, 17/40, 17/42, etc. I also wish to change the final drive sprockets. I haven’t yet decided on the combination but I definetely think that 6000 RPM at 100 Km/h is too high an engine speed. My questions – Do you know of one or more suppliers of these sprockets? If you go on ebay and search for “Virago 250 rear sprocket” and also “XV250 rear sprocket”, you will see a quite a few sprockets. The brand names are usually JT or Sunstar. Good luck with your search and let me know how it goes. hi my name is frank davis. I did the the change to my virago 250 2005. I love it 16/38 sprocket went with bigger jet in carb k and n air filter also pipes what a great way to ride like a real bike. Today on a flat rt 70 ROAD in medford nj I hit speeds of 85 mph. before the sprockets I hit 70 mph and my engine was going to blow up lol. NOW IT IS SO BETTER NOW IT GOES FASTER AT A MUCH LOWER RPM !! I LOVE MY BIKE . I AM 210 POUNDS AND MY BIKE RIDES SO GRAND AT 65 70 NOW. THANKS FRANK….. MEDFORD NJ . I changed to 17/40 and I love it! The engine now revs at 5000 RPM at 100 Km/h and that sounds a lot better than the previous 6000. I bought the sprockets and chain link from Sunstar as you had suggested Les. The sprockets seemed fine until I noticed the the M6 tapped holes in the drive sprocket had not been made. I had to go out and buy the tap. I was extra careful not to break the tap since the sprocket is slighly hardened. I also removed two chain links down from 114 to 112. I made my test drive at a chilly 3 deg Celsius (38 farhenheit), possibly the last ride this year. I’m anxious to see the change in gas mileage…more on that next year. I’m reading so many forums about sprockets change and it seems like most of discussions are focused on the 17/38 and the 17/40 options but I’m getting really confused on what should I fit on my bike (MY 1993, 49k). I’m 6 feet tall and I weigh 165lbs. I live in Melbourne (Australia) where most of my rides are a mix of urban highways and hilly landscapes in the countryside although not extremely high. I quite like riding on fast winding roads but although the stock sprocket should suit this scenario they actually quite unfit. Above all i find frustrating not having any pickup when gearing down as when I turn the hand grip I don’t feel the pushback i’d expect, the bike just revs up a lot as it was going to explode needing desperately next gear up. Also when I’m on a 5th gear at 110-120kph I feel like it could still give me a lot more but no 6th gear is available! I recently replaced friction and clutch plate but the only advantage is a smoother gearing so I’m pretty keen to change the sprockets. For travel on “high” speed paved roads, the stock 16/45 sprockets are way too low. I think of 17/38 as the correct stock gearing and then I would adjust from that to fit your driving conditions. 1) If your Virago 250 is not running as strong as when it was new. 2) If you carry passengers a lot. 3) If you have added a windshield, saddlebags, and other heavy accessories. 4) If you have a larger rear tire (140/90-15). 5) If there are lots of hills where you ride. If your Virago 250 is not running as strong as when it was new + you carry passengers a lot + one of the others (3, 4, or 5), you should consider 17/42. For a 165 lb. driver, a Virago 250 that is running strong, not carrying passengers most of the time, I would go with 17/38. Most Virago 250 owners that change to any of these really like it – it is like a different bike. Let me know how it turns out………….. Thanks for the prompt reply. I definitely meet conditions no.1, no. 3 (e.g. Saddlebags and backrest) and half of the no.5 (I ride on hills in the countryside but i still have ride on long highways to get there). I ride 99% of the time on my own, I will probably have my gf joining me sometimes in summer but nothing consistent. Do you reckon I should go 17/40 or 42? 2) You ride in hills half the time and long highways half the time. 5) Your weight is 165 lbs. But review the six factors again – if you can think of anything negative that we missed, then you might want to consider 17/41. Six factors are correct, only amendment is on negatives point 3 because I don’t have a windshield but only saddlebags and a backrest. So at this stage I would go 17/40 and I’ll change the chain also (O-ring). 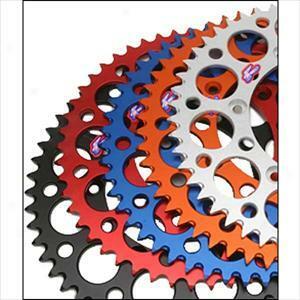 Btw is there any difference between JT and Sunstar sprockets as far as you know? I’m probably buying a bundle from ebay and apparently the only difference is that the JT’s have 106 links instead of the 114 of the Sunstar’s plus JT are cheaper. For 17/40 you will need 112 links. I added a “number of links” chart to the bottom of the post. I know that Sunstar is normally more expensive than JT, but I have never heard if it is higher quality. Possibly Sunstar is made by JT. I would just get the cheapest one. As I mentioned in a previous post, I changed my sprockets to 17/40 and it’s fine for me. I just want to warn you about the connecting link that you will need. The chain on my 2012 VStar is not an O-ring chain. It was not evident which of the 3 choices of links to order from Sunstar. I opted for the #SS520XTG-L link which happens to be an O-ring link (the picture is the same for their 3 choices!). I used it anyway, using the O-rings on the outboard side only as there was not enough space for all 4 O-rings. Also the connecting plate was very hard to push onto the pins. Maybe you can email them before asking them details on their connecting links. Lastly, you will have to remove 3 links from the chain to end up with 112 links with the new connecting link. Happy summer. We are entering winter here in Montreal. I’ve contacted the ebay seller to ask more information about their products because as you said they use the same pictures (don’t know if it’s the same guy but currently on ebay the only seller selling either the JT bundle and the Sunstar one is “jawzys” from Ohio). In particular I’ve inquired about the chain links in the bundle because the Sunstar one ($50 more expensive) comes with 114 links and the JT with 106 which doesn’t make sense as the stock one has 114 links. They replied “We try to do the math so you don’t have to cut a chain down to length, sometimes we are off. What I’d recommend doing if you purchasing the JT set, in the notes of the check out portion just request the size of chain you know to work and that’s what we will send. From what I’ve seen however is the 91-94 model year machines aren’t covered by our sprockets and I can’t say that this kit will work or not.” This is my dilemma now because my bike is a 1993 and on ebay i found only items up until ’90 and from ’95 onwards. It seems like no virago 250 have been made in that interval. Honestly I believe that it will fit anyway according to the most the virago has been looking the same for 24 years, however i’ll ask my trusted mechanic today. Yves if you want to come down under for a ride this is the best time. Thank Yves and thanks Les and to anyone else in this discussion, your help is invaluable!!! I am looking to go for the 17/40 set as well and have found the kit from “jawzys” in Ohio as well – did you find out whether this kit will fit the 91-94 models? Mine is a 94….. And what about the O-rings – is this the type of chain I want? And does the JT kit come with 114 links or only 106? All the “jawzys” sprocket sets I saw were for 1995 to 2007. I do not know if they will fit the 1994 model. You might try the Virago Tech website to answer this question. I spent 15 minutes on it and I could not find this information. I would go with an O-Ring or X-Ring chain. I got a low cost O-ring chain ($40.35 shipped) and it is doing great – after 6,700 miles, it seldom needs an adjustment. “Jawzys” current ebay listing for the JT set says it is 112 links. I understand that I should get an O-ring chain, my only concern is whether there will be room for it as I understand it is a little wider than a regular roller-link chain? Will the O-Ring fit without having to do modifications on the bike? If so, I’ll get a set og sprockets and chain – I believe it will fit the 1994 model as well…. It is highly unlikely that you will have a problem with the width of O-ring chain. I have an O-ring chain on my Virago 250. If you look at your chain from the rear, you can see that there is extra room on both sides of the chain. Your V Star 250 sounds great. 17-40 is a good choice with the hills and extra equipment. I am waiting for the snow to leave, too. I lived in Lexington KY from 1976 to 1979, and we got a lot of snow especially in 1976 and 1977. If the box that you have is #40 chain, it will not fit. 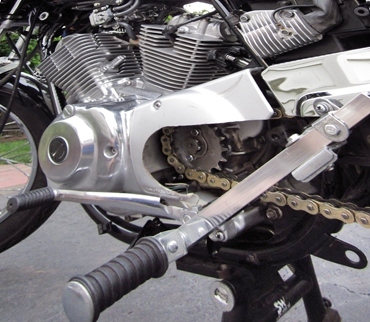 A virago 250 with stock sprockets (16 front/45 rear) takes 114 links of #520 chain. Do you think I would have a problem running 17/45 with the stock chain? Yes – 99% of the time it would be fine. The only time you would have a problem is if the rear wheel/chain adjusters were all the way forward. Hi Aaron, one more tooth on either sprocket means 5/8″ more in chain length. If the rear wheel adjustment has at least 5/16″ play on the inboard side (towards the front), that means you can move your rear wheel towards the front and thereby be able to use the same chain. Good luck. Very good info regards this ,,, les . Im looking to change my 250xvs yamaha which is currently 20/56 to the equivalent of the virago 250 17/38 combination . What would you suggest here ? i was thinking if i had a rear sprocket made it would be a 46 giving me a 20/46 combi . My chain is 428 can i do this without changing my front sprocket and chain as its still new . I think the 250xvs is a little heavier than the XV250, so 21/48 (18.4% change) would be a good choice, too. You wanted to do 20/46 (17.9 %). It should be OK – but on the xvs, I don’t know how close the chain is to the swingarm. If it is close, you might need to grind/sand it a little, plus check and adjust the chain more often. You will need to shorten the chain. If you have a bench grinder you can do it yourself. If you are not sure how much to take off, start with a lower amount. Example, if you need 6 or 8 links off, start by taking out just 6 links. Let me know how it goes! -Les S.
Hello les ,,,,,, Ive since found out a 428 setup is impossible to get in the gearing to the equivalent of the xv250 17/38 gearing in the 520 .Ive now had to go to plan B , which is a 520 conversion kit . I thought in a 520 front & rear sprocket to replace the the existing 428 20/56 sprockets would need to be a 21/48 ,,,, HA HA ! was i wrong ,,, i hadnt taken into consideration “the pitch” Luckily i was stopped in my tracks before ordering these gigantic sprockets . As ive done , ive ordered the 17/38 in the 520 conversion kit which is the same as the XV250 + V-STAR use when changing sprockets . Its not costing me an arm and a leg to do this either . what do you think ? do the ratios hover around the 2.235 – 2.350 mark ? If so ill be very pleased . Les ,,, ive now learnt that i can only go to a 15/38 sprocket with the 520 conversion . This is due to the spline on the xvs 250 differing from that of the xv virago 250 . How will this feel coming from the current 428 20/56 i now have . Personally, I would do the 20/56 to 15/38 change only if the price was right – don’t pay too much. There should be a better solution – it would be good to find out what other 250xvs owners are doing. I’m buying an ’82 Yamaha 550 Maxim with 33k miles (53k km) and already looking into re-gearing the sprocket/countersprocket, to save a little wear on the engine and mileage a bit with lower cruising RPMs. The stock setup is 16/45, and I’m already looking into adjusting to 17/44, which is an 11% RPM decrease at 60-75 mph (100-120 km/h) cruising speeds. I love to ride, and I’m not a speed junkie, so I’m willingly prepared to give up the acceleration. (Lower RPM, cooler running engine = more efficient, less wear) Good assumption? My question is what you think of re-gearing more to 18/43, 17% RPM decrease? Both of these setups have no effect on the chain length, require a 1-2mm axle adjustment. And even 18/44 would only be 3-4mm of play(15% RPM decrease). I know the big issue is, will I have enough power in the lower RPMS to move along? The 550 is a 6-gear, so I’m assuming after I get moving from a stop the 6 gears will handle the adjustment just fine. I’m 160lbs, but on light trips with the girlfriend I’m expecting our combined weight to be around 300lbs. What do you all think? I do not know your bike, so I don’t know if the factory gearing is low, or just right. If you get into 5th by 35 mph, or 6th by 40 to 45 mph, then maybe 10% higher gearing will work. If when accelerating from 70 mph in 5th, if the bike seems stronger than it needs to be, then you might could use higher gearing. If 6th seems like an overdrive, better for cruising than accelerating, then maybe the stock gearing is just right. I think that after you drive the bike awhile, you will get a good idea on how much, if any, you can raise your gearing. I’m going mostly based on my 7 years of riding a Kawasaki 750. It was geared much too low for a 5-speed, and ran around 6,000 RPM at cruising speeds. Probably the reason for its early demise despite being under 30k miles. I’ll ease into the process and start with adding +1 to the sprocket(since the chain looks worn) and let you know the results. I have a 2003 Yamaha Virago 250. It is my starter bike (bought it used in 2008) and I can’t bear to part with it just yet. Got it with 10K miles already on and have since put on another 20K miles. For the most part, my commute to/from work is less than 10 miles per day, none of it on the highway (all less than 70km/hr). I usually only ride with me (115 lbs) and a windshield. However, most of my mileage has been when I’ve gone on my motorcycle adventures. To get there, I will typically ride 3-5 hrs on the freeway (110-130km/hr) for 2-3 days to get to awesome mountain riding (ie the Alps). I will have saddlebags (softsided) and maybe another bag or two strapped to the sissybar (I don’t carry other passengers)….so maybe 50lbs total in baggage weight. I don’t have problems starting from stop, but I do struggle with trying to pass others even on back roads (90km/hr). My chain has recently required frequent tightening, so I’m looking to replace the chain and sprockets and was hoping you might make some suggestions as to which size sprockets might work best for me. I’ll start with 17/38 – that is the “correct” combo for the Virago 250 and that is what it should come with from the factory. If you were heavier and the bike a little down on power, I would go 17/40. With “some” hills 17/40 might be your best choice. With a lot of hills, you might go with 17/41 or 17/42. I found that 17/38 was faster than 17/40 up to 105 to 113 km/hr, then slower above that speed. This is because with 17/38 you can be in a lower gear – except over 105 to 113 km/hr – when you are in top gear. Fifth gear does not climb hills as easily as with 17/40 and strong headwinds affect the bike more – this is expected, but is still a downside of 17/38 – “less power” over 105 to 113 km/hr (because you can be only in 5th gear). 17/38 would help, too, with your “hard to pass” problem over 90 km/hr (up to 113 km/hr). You can also improve your passing ability by starting to accelerate way earlier to build up your speed/momentum. Keep in mind I am 230 lbs with gear, my engine is probably not quite as strong as when new (I have 23,000 miles on it), and my driving includes some hills. You did not mention tires, but I prefer a 130 rear tire (Kenda brand) over a 140 for lightness/more performance. i recently purchased I used 2011 v star 250. It has about 8000 miles on it. I have read the thread and I cant seem to decide on an appropriate mod. I weigh about 165lbs and my motorcycle doesnt have any accessories, I dont plan on carrying a passenger (don’t even have the rear seat :)) my commute involves flat roads with a mix of highways and local roads. Everything on it is stock. I dont plan on riding faster than 60mph. But I would like to go from 0-60 faster and smoother. (Keeping in mind its a 250 cc cruiser)Like most riders I dont like the stock gearing especially the lower gears as they are useless even for local riding. Which sprocket combination should I go for? Also which chain should I purchase. If some one can post a link to Amazon or some other website that would be great. Lastly I plan on doing it myself so any input will be appreciated. For any low-mileage Virago 250, I recommend 17/38 – that is the “correct” combo for the Virago 250 and that is what it should come with from the factory. With 17/38, fifth gear is a lot like overdrive. If you want fifth gear to be a little stronger, go with 17/40. For a chain – stock is 520 x 114 links – I have a low cost O-Ring chain on mine that seems fine. I got it on ebay for $40.35 shipped. It was not a “brand name” chain. It is better to get a 120 link chain and cut it to fit. For 17/38 you could try 114 links before reducing it to 112. To remove links, you need a chain-breaker or a bench grinder. Hope this helps. If you need a long version of the chain installation procedure, just let me know. I appreciate your response . I think I will go for the 17/40 as I am not sure of the power on my bike because I bought it used and its my first motorcycle I have nothing to compare it to. Also I would like to keep a little leeway just in case. Will i loose a lot of low end acceleration with this upgrade? Typically in the speed of 40mph and below . Also I have never done any work on a motorcycle , im mechanically apt and do basic maintaince on my car like chaning oil, brakes etc myself. Is this doable for someone without much prior knowledge or is it recommended to visit a mechanic. I bought a sunstar kit fom jawzys on ebay it has a o ring chain and the 17/40 sprockets hopefully its compatible. I’m trying to figure out what is best for me? I mainly do flat city driving. But want to be able to do some high speed highway riding. I’m 150 pounds. I am running a 100/90/18 front and 140/90/15 rear. Which set up would you recommend? I would go with 17/38. When you change rear tires, you might want to get a 130. Well I just bought the 140… In that case would you still recommend the same sprockets?? Are you running stock rim setup ? With those tires and do they fit without any modification ? Yes I have stock rims. Changing the stock 130 tire to a 140/90-15 is usually pretty easy. There is not much of a rubbing issue with the 140 unless your bike has rims that are out of true. How about the front tires ? 200 lbs..windshield.. no passengers. … some hills.. hiway as well. Would you go with 17/40? Sorry – I missed this one – gee, hope you still have the bike. That is about the same as my setup and I prefer 17/38. Things that would make you lean towards 17/40 would be: if you have a 140 rear tire, if your engine is not running real strong, or if you don’t want fifth to be just an overdrive. Either 17/38 or 17/40 is fine – there is not just one correct anwer to this question. Hi Michael. Just chances mine to 17/40. I am 160 pounds, no windshield, no passengers no hills but windy area. My 5th works like an overdrive – or snive 60-65 mph i have no accelleration, but can maintain speed. I i want to go faster than 65 i need to use fourth to get the speed. 4th is like my old 5th. It is posible to cruise at 30 mph in 5th. Also i have no sissybar or sadle bags. Running light weight. I made the switch to the 17/40 sprockets (<$40USD), + K&N intake filter ($30), + "Larish41" exhaust pipes (straight, slash-cut drag pipes, no baffles). For me, this DID require a carb re-jet (#120 main, #20 pilot), which was super-easy. Yes, the performance improvement is dramatic. However, no-one ever seems to mention that… after the sprocket change… the min/max speed in 4th gear (@rpm) is very comparable to the former 5th gear.. however, the transmission pulls @ 1:1 ratio in 4th gear vs. 1:1.25 in 5th. So you have better torque & power distribution across the drive train in 4th gear @ speed after the switch. This means you can maintain speed &/or accelerate to ~75mph while going uphill (~5-9% grade) in 4th gear with new sprokets, versus decel. to 55/60 in 4th/5th with the old sprockets. I’m on a 93 xv250 without pillion. I weigh 65kg (143 pounds) and I do a lot of highway riding at around 100-120kmph (62 – 74mph) and the bike revs quite hard. I’m interested in lowering highway revving and increasing fuel economy. I also live in a semi hilly area and was wondering if a 17/38 ratio at my weight would do. I carry a medium sized top box but no saddle bags, passengers or windscreen. The bike runs well to my knowledge. Any help would be greatly appreciated. My first choice would be 17/38. My second choice would be 17/39 (if you can find a 39 T sprocket). Thanks mate, I’m picking up a 17/38 set this arvo. I just did the 17/38 change on my ’09 V-Star 250. It definitely seems to accelerate a bit more slowly in any particular gear, but that’s more than offset by not needing to be in 5th gear by 35 mph. This is definitely a better ratio for this part of the world, so thank you for the advice. Yesterday I changed the sprockets on my 2010 XV250 to 17/40. It took me 2 hours and was much simpler than I expected, after watching another online U-tube video. I took it for a test drive and was surprised at the changes. I was able to cruise at 55 mph (with my optimistic speedometer) where at about the same RPM I would have been doing 40-45 mph. I had been leery about taking it on the freeways around LA at speed because my top speed seemed to be the cruising speed of drivers around me. That’s not true now. Acceleration actually was not hurt after the change. This article has really helped make my bike more traffic friendly and given me more confidence on it. Can’t thank you enough. Hi Steven, Thanks for the nice comments. – Les S.
I have a 2009 V star 250 and I decided to upgrade the sprockets to 17 in the front and 40 in the rear. What I don’t understand is how will my 5 gears work? What I’m asking is when will I have to change my gears? With the upgrade to 17/40, I change gears every 10 or 15 miles or they remain at the same speed as standard? Yes – it is a correct assumption. Basically you stay in the lower gears longer. Example: If you used to change into 5th gear at 30mph, now you might go into 5th at 45 mph. I just got the new chain and sprockets and I will work on the bike this weekend. I will take it out for a test once finished. I’m also looking to commute to work on Rt 322 South New Jersey toward Hamilton Mall to Atlantic City Airport. With the upgrade I should have a better commute. Over the weekend I installed the new sprockets and chain: 17/40. Wow, what a difference. A huge improvement, commuting to work for one hour and cruising at 60 – 65 MPH is enjoyable. I do have one issue and that is the winds. I don’t have a windshield installed, so maybe that would help. When the winds are strong I have to drop down to 50 – 55 MPH. I just took my bike out to confirm at which speeds .. but then I realized my speedometer isn’t all that accurate and have no tach. “17/40 – 19.5% higher gearing -2/0 ………. 112 .. 112 Chain will fit perfect, with full adjustment available”. When I shift it seems to be at higher speeds than these. I will work on the bike this weekend, just got the new chain and sprockets. I appreciate your time and help. I also don’t have a tachometer on my v star 250. I was thinking about installing one, I’m just not sure how to do that. That would be the next project on the bike. I will report back once I finish the upgrade and take it for a test ride. I upgraded the sprockets to 17/40 and new chain over the weekend. I like the difference, the bike is now riding more like a real motorcycle should. My commute to work is easier and I can cruise at highway speed 65 MPH. I’m still not sure about the 4th gear? I do wonder if I can go past 65 MPH with the 4th gear, since the 5th gear is like an over drive and my understanding is that it would top at 65 MPH. Is this a correct assumption? I did try to down shift to 4th gear when I was at 55 MPH, but the bike was running high and so I up-shifted to 5th gear and that was better. So, what I am trying to find out is the following: 5th gear is over drive and good for cruising speeds: 60 – 65 MPH. What about the 4th gear? Should be used when climbing hills or when wanting to pass cars on the highway and go faster past 65 MPH? I also don’t have a tachometer installed. That would be my next project. I would use 4th gear up to 62 to 65 mph and 5th gear above 62 to 65 mph. For a speeds-in-gears chart, please see the “17/38” tab on the website. Redline on the Virago 250 is 8,000 rpm.